If you're looking for a particular article and don't know the release date then perform a keyword search on the Louisiana Bar Journal archive. The LSBA offers its members print and online publications to stay current on general legal issues and on Association projects and services. 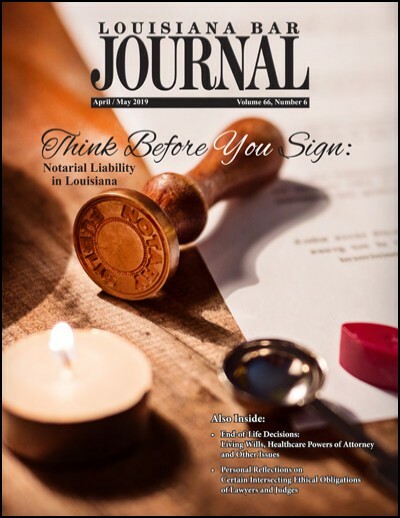 Members receive the LSBA's archived publication, the Louisiana Bar Journal, a bimonthly magazine containing substantive law articles and Association news. The Recent Developments section in each Journal is essential reading for lawyers to learn of changes in the laws. LSBA members also receive the online, bimonthly Bar Briefs. which features Association news. The LSBA archives the Louisiana Bar Journal and the Bar Briefs online. To search for a specific article or to review the whole publications, you may query the publication database by month, year and/or keyword. Read the Louisiana Bar Journal, Volume I, Number I, July 1953.